The aerial photos listed on this page are downloadable files in MrSID format, intended for use with Geographic Information System software. The images may also be viewed with the free MrSID viewer available from Lizard Tech. Additional information about MrSID files is available here. Each link below is for a large (2-15 Gb) MrSID image of the river corridor in one county. Please contact us if you need to have these files sent to you. Each link below goes to a web page where you may download images for part of the county or the entire county. 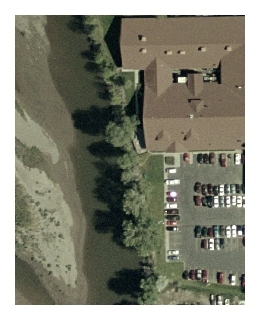 Includes aerial photographs and aerial photo mosaics from which other baseline datasets, such as banklines and flowlines are extracted. The historic bankline and flowline datasets are then used to develop indicators of change within the Yellowstone River stream corridor. They are a foundational element of the Yellowstone River Cumulative Effects Assessment because they allow detection of change within the stream corridor over the last 55+ years.